Most people considering a major project need answers to a few basic questions before they can proceed with confidence. Can you deliver what I am expecting? What are the costs … really? Our goal is to provide basic answers to these questions prior to entering into any agreement for services. This means that before you ever spend a dollar, you will have a pretty good idea of where we are heading. When we meet, we will have one primary goal: To get to know you. Before we ever set pencil to paper, we need to understand you: How you live, how you cook, how you entertain, etc. In the middle of all this, you are getting to know us too. Once we know a little bit about you, we will set about understanding your home. How does the space plan succeed or fail now? How can it be improved? What are our limitations? Next, we take some measurements and explore a few ideas on paper. It will take a few days to prepare a preliminary design and budget for your review. At this point nothing is set in stone, but we have some basic information to work from. You can expect to see a preliminary floor plan, along with some elevation drawings and sketches. We may also suggest cabinetry styles and finishes for you to take a look at. Along with these, a preliminary budget will be ready for your review. Now, having had a little time to get to know each other, and understanding our vision for your project and the related costs, you should have all you need to make an informed decision. It’s here that we will ask you to enter into a Design Agreement. Once you have entered into a Design Agreement with us, all of our resources become available to you. We will work as long as it takes to perfect the design. (You heard that right!) We will select a cabinet manufacturer, and develop door and finish samples specific to your project. We will make ourselves available to help you select appliances, counter tops, back splashes, plumbing fixtures etc. and will detail all of this in our drawings for your approval. It’s during this design phase that we will be interacting with the other professionals who may be involved in your project. 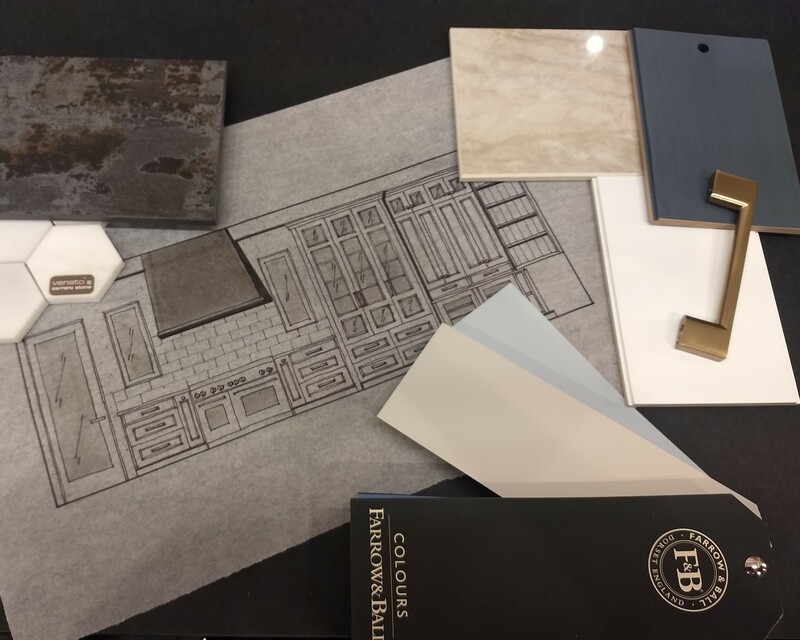 Your General Contractor, Architect, and Interior Designer will all be involved and working hard to ensure that you recieve the best each of us has to offer. If you need a referral to any of these professionals, we will be pleased to make a recommendation based on the scale of your project and the availability of the people we work with. Once we have the project styles, colors, and materials selected, we will produce a photo realistic artist rendering of the project. This gives our customers the best available peak into the future, and allows us to make any final adjustments to the design. Once the design is complete, we will draw up a purchase agreement and process the order for your cabinetry. The design deposit is credited toward the total, and we request 50% of the balance to order. The remaining balance will be due just prior to delivery to the job site. Shortly after processing the order, we will recieve a delivery date from the manufacturer. In our experience, these dates are relatively accurate, and they allow us to establish a “critical path” for the progress of the job. Most of our manufacturers requre an 8–12 week lead time. All appliances, plumbing fixtures, tile etc. will be pre-ordered for the job so that you are not waiting unnecessarily for deliveries. This is why we work with you so thoroughly through the design and selection process. We can only order the items you have selected. If we are waiting on a selection, the job could be held up at some point down the road. During the construction process, the project is handed over to your general contractor, but we won’t disappear! We remain available to you for questions and detailing throughout the process. We do recommend that your cabinetry be installed by one of our preferred installation contractors. Proper installation of our product requires some familiarity with our systems and techniques to ensure the best possible finished product. Construction is not an exact science. We will have done our best to anticipate problem areas, and yet challenges always present themselves. We believe that there is no such thing as a “kitchen remodel emergency”. Any problem can be corrected. We understand the process and are equipped to provide solutions, working together with the other team members to solve problems rather than assign blame. We are most interested in the satisfaction of our customers and will work tirelessly toward that end.